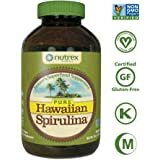 Sold by Perella's and ships from Amazon Fulfillment. 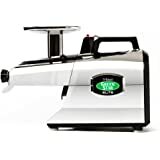 The Omega J8006 nutrition center is a masticating style juicer. WARNING: Consuming this product can expose you to chemicals including lead, which are known to the State of California to cause cancer. For more information go to www.P65Warnings.ca.gov/food. We have had this machine for about 3 years now. 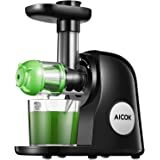 I really like this juicer a lot because the juicing parts (not the motor body) go in the dishwasher and it is easy to assemble and easy to clean. 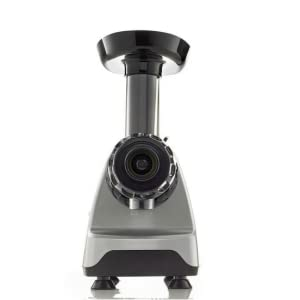 It has an excellent warranty, which you will need to use frequently (more about that later). 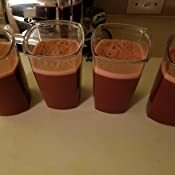 It juices a lot of different fruits and veggies - not so good with pineapple, strawberries, blueberries, etc., but excellent for leafy greens, oranges, crisp apples (mushy apples, not so much) cucumbers, celery, beets, etc. 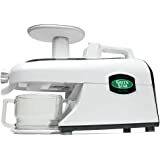 I cannot recommend this machine, though, because the parts break all the time, and they are not always in stock from the manufacturer, and for as often as they break, they are unreasonably expensive. For example, the screens crack and then break--they are the weakest link. But the end caps also break off. Then you have all your produce go to waste while you wait for parts to be delivered. It makes me really question the other reviews on here. I know I am not the only one. Just search for the screens on Amazon and you will see that the screens only get a 3 star rating because of the way they break all the time. You can also go on their website and try to purchase a replacement screen - they are not even available right now and you can't even find them on their website. I hate to bomb this product, but after 3 years, I am researching a better machine because I am so tired of the parts breaking. 5.0 out of 5 starsJuicing POWERHOUSE! 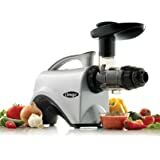 I am a research shopper and it took me several weeks to decide which juicer would fit our needs. 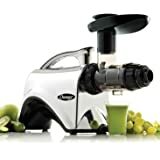 I actually bought 2 this Omega J8006 which is a Masticating Juicer (which I am sure many of you know) and I also bought a Oster JusSimple 5 Speed Easy Clean Juice Extractor with Extra-Wide Feed Chute, FPSTJE9020-000, 1000W, Black/Silver a Centrifuge Juicer that we picked up at Target for $79. Both are excellent juicers and serve different purposes in my kitchen. 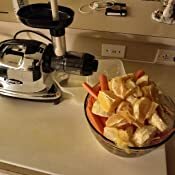 We juice daily, to the tune of about a half a gallon daily for 2 people, with a large variety of fruits and vegetables. 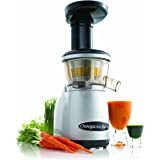 My Omega is my go-to juicer for sure, I have even come to love my orange, pineapple and other tender skinned fruits juiced with the Omega over the Oster. 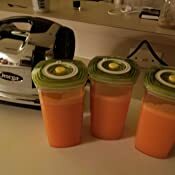 I run it every night for 30-45 minutes to make juice for the next day, the cups you see are the bomb Freshseven Vacuum Seal Air-tight Fresh Juice Container Reusable Yogurt Cup Instant Marinator with Air Pump- 26 Oz. 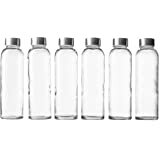 (750 ml) with Measuring Scale Made of Tritan BPA Free Dishwasher Safe Leak Proof they will keep your juice fresh for 72 hours! 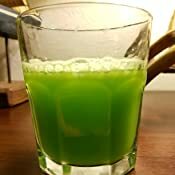 I also run it every morning to make straight celery juice (not for the faint of heart :P) it's a solid workhorse, quiet and so so easy to clean! I love it, I use it and I will swear by it, get the Omega and Happy Juicing! 1.0 out of 5 starsAvoid this! 1.0 out of 5 starsThe juice stops when the plastic clips on the drumcap snaps. Part availability and customer service is far less than adequate. One star you ask...indeed, why one star? Doesn't this juicer, juice? Why yes, it does or at least it did. Here is the issue.The little black cap on the end happens to be made of plastic and has three plastic clips that hold it in. 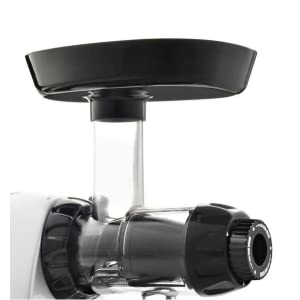 Without these little clips doing their job,the cap cannot stay in place and therefore the juicer cannot juice. So of all of the possible pieces to break on the machine first, guess which broke? The first clip, oh well it still closes. Then a few minutes later, the second. Oh dear, we have no juice...well, certainly a replacement cap can be procured for a reasonable price. $12.00 on the website. It is out of stock and seems perpetually so. They are being sold on ebay for $95.00-ish. Hmm, lets call to ask. .The rep said something without taking a breath that went like, "Oh, um, uh, its out of stock, that part is under warranty, I can give you a white one just send a picture of the broken one and you can get on the list for back order." 4 days after the requested email "l'm Sorry we are out of stock on the part that you need. I have done up a back order so I can send it as soon as it becomes available." I don't prefer being lied to after an appliance beaks mysteriously at seemingly its only vital point while these caps are out of stock with the company and being sold for extortionate prices elsewhere online. Well, you know, if you were to take some light gauge iron wire and simply wrap it around the cap and drum inlet and outlet tubes on the top and bottom of the drum and it will juice and only adds about 2 minutes to the cleaning. I attached a picture. This should keep the juicer functioning until my new Super Angel arrives. 1.0 out of 5 starsPoor Design. 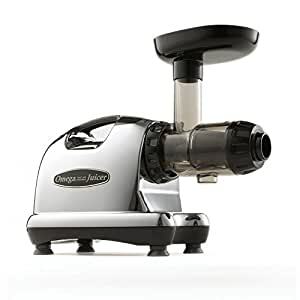 Do yourself a favor read 1 star reviews on this juicer plastic screen that fits over auger self destructs in about 2 months or less. Replacement cost 130.00$ . It cannot handle the pressure going between it and the auger. 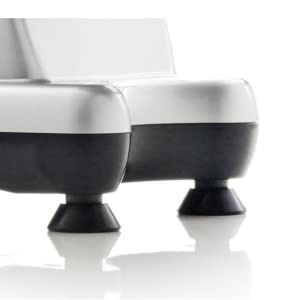 Poor Design.